The stratum granulosum of bigger follicles consists of a pseudostratified columnar epithelium that will get elongated again to a flattened epithelium just before ovulation. The theca folliculi can hardly be divided in a theca interna and theca externa. (The theca externa normally is of a more fibrous nature, whereas the theca interna contains spindle-shaped cells). Thecal glands (cellulae thecales) are located in the theca folliculi. 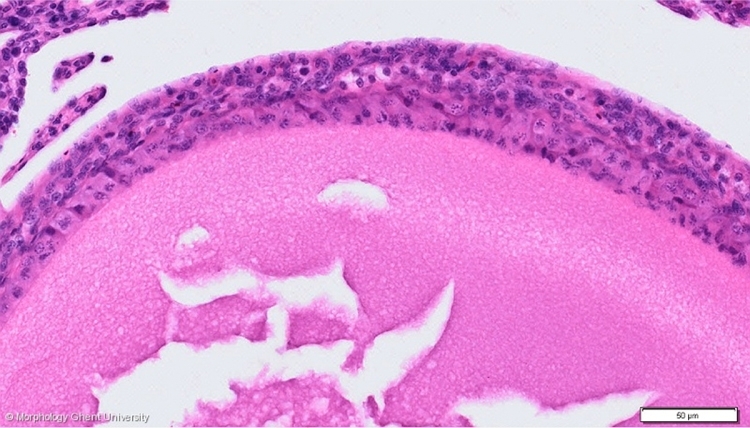 These glands are groups of pale interstitial cells that produce estrogens. For more detail of thecal glands and endocrine cells in the ovary: see endocrinum.